Have you ever thought about writing your life story for yourself, your family, the world? On June 15th, Patricia Charpentier will be presenting a fun and lively workshop on Writing Your Life hosted by the Florida Writers Association's Ancient City Chapter. In this class, Patricia will introduce you to some of the many approaches to writing personal and family history and give you her top five tips on how to get started. 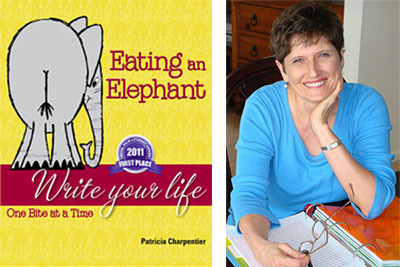 Drawing on information from her multi-award winning book, Eating an Elephant: Write Your Life One Bite at a Time, she uses everyday language, humor, and real-life examples to discuss how to organize your material, gather story ideas and other topics related to writing the story of the one and only you.